Vernon A. Walters (January 3, 1917 – February 10, 2002) was a United States Army officer and a diplomat. Most notably, he served from 1972 to 1976 as Deputy Director of Central Intelligence, from 1985 to 1989 as the United States Ambassador to the United Nations and from 1989 to 1991 as Ambassador to the Federal Republic of Germany during the decisive phase of German Reunification. Walters rose to the rank of lieutenant general in the U.S. Army and is a member of the Military Intelligence Hall of Fame. Walters was born in New York City. His father was a British immigrant and insurance salesman. From age 6, Walters lived in Britain and France with his family. His formal education beyond elementary school consisted entirely of boarding school instruction at Stonyhurst College, a 400-year-old Jesuit school in Lancashire, England. He did not attend a university. At the age of sixteen, he left school and returned to the United States, to work for his father as an insurance claims adjuster and investigator. In later years, he seemed to enjoy reflecting on the fact that he had risen high and accomplished much despite a near-total lack of formal academic training. He was fluent in French, Italian, Spanish, and Portuguese as well as his native English. He also spoke German fluently but, as he joked, inaccurately, and knew the basics of several other languages. His simultaneous translation of a speech by United States President Richard Nixon in France prompted French President Charles de Gaulle to say to Nixon, "You gave a magnificent speech, but your interpreter was eloquent." Walters joined the Army in 1941 and was soon commissioned. He served in Africa and Italy during World War II. He served as a link between the commands of Brazilian Expeditionary Force and U.S. Fifth Army, earning medals for distinguished military and intelligence achievements. He served as an aide and interpreter for several Presidents. He was at President Harry S. Truman's side as an interpreter in key meetings with America's Spanish- and Portuguese-speaking Latin American allies. His language skills helped him win Truman's confidence, and he accompanied the President to the Pacific in the early 1950s, serving as a key aide in Truman's unsuccessful effort to reach a reconciliation with an insubordinate General Douglas MacArthur, the Commander of United Nations forces in Korea. In Europe in the 1950s, Walters served President Dwight Eisenhower and other top US officials as a translator and aide at a series of NATO summit conferences. During this period he participated in the famous visit of Eisenhower to General Franco. He also worked in Paris at Marshall Plan headquarters and helped set up the Supreme Headquarters Allied Powers in Europe. He was with then-Vice President Richard Nixon in 1958 when an anti-American crowd stoned their car in Caracas, Venezuela. Walters suffered facial cuts from flying glass. The Vice President escaped injury. In the 1960s, Walters served as a U.S. military attaché in France, Italy, and Brazil. In 1961, he proposed an American military intervention in Italy if the Socialist Party had participated in the Government. While serving as a military attaché in Paris from 1967 to 1972, Walters played a role in secret peace talks with North Vietnam. He arranged to smuggle National Security Advisor Henry Kissinger into France for secret meetings with a senior North Vietnamese official, and then smuggle him out again. He accomplished this by borrowing a private airplane from an old friend, French President Georges Pompidou. He had previously been chosen by Richard Nixon to be their translator/interpreter during Pompidou's 1970 trip to the United States. Despite numerous importunings from on high, [Walters] flatly refused to ... cast a cloak of national security over the guilty parties. At the critical moment, he ... refused to involve the Agency, and bluntly informed the highest levels of the executive [branch] that further insistence from that quarter would result in his immediate resignation. I told [President Nixon's White House counsel] that on the day I went to work at the CIA I had hung on the wall of my office a color photograph showing the view through the window of my home in Florida ... When people asked me what it was, I told them [this] was what was waiting [for me] if anyone squeezed me too hard. Beginning in 1981, Walters served under Ronald Reagan as roving ambassador. Reagan used prominent Catholics in his government such as Walters to brief the pope during the Cold War. 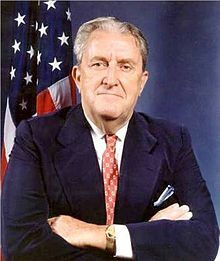 Walters was then United States Ambassador to the United Nations from 1985 to 1989 and ambassador to the Federal Republic of Germany from 1989 to 1991. Here he was responsible on behalf of the United States for the preparations of the Treaty on the Final Settlement with Respect to Germany. During the 1990s, after he had retired from public life, Walters worked as a business consultant and was active on the lecture circuit. On November 18, 1991, he was presented with the Presidential Medal of Freedom by President George H. W. Bush. He wrote another book, The Mighty and the Meek (published in 2001), which profiled famous people with whom he had worked during his life. Walters was portrayed by Garrick Hagon in the 2002 BBC production of Ian Curteis's controversial The Falklands Play.